Electrolytic capacitors can dry out and fail, and with retro machines now 30+ years old it's a good idea to replace them before damage occurs. 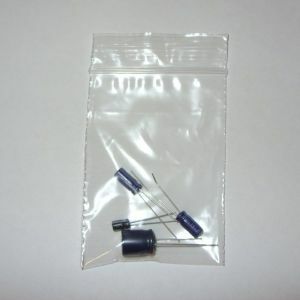 I have made up replacement capacitor packs for the various C64 motherboard versions (going by the ASSY / REV number printed on the top of the PCB). All caps are good brand, long life types. For ease of fitting, they have the same case style (axial/radial) as the originals. * Please note: C88 and C90 may vary on this board - Sometimes C88 is 1000uf 25v and sometimes C88+C90 are 470uf 50v. Please choose Pack #2 or Pack #4 instead if this is the case with your C64. 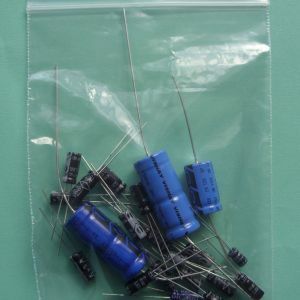 1 x 2200uf 16v (C63) - Use pack #7 if this is actually 1000uf 16v on your board - that is the most common type. This set is for the C64C style Commodore 64 PCB Assembly No: 250469-01 (PCB 252311 Rev. A, B, 3 or 4) with a 1000uf capacitor at C63 - this is the most common type. Also included, for the motor control PCB: 3 x 10uf, 2 x 4.7uf, 1 x 2.2uf, 1 x 1uf, 2 x 0.47uf (all radial types) these cover three of most common varients of this sub-board. Please check if you need different types. IMPORTANT: Please check your board's assm number (or the caps themselves) before ordering. If you require a pack with differing caps, contact me and I'll see what I can do. Also included, for the motor control PCB: 3 x 10uf, 2 x 4.7uf, 1 x 2.2uf, 1 x 1uf, 2 x 0.47uf (all radial types) these cover 3 of most common varients of this sub-board. Please check if you need different types. IMPORTANT: Please check your board's assm number (or the caps themselves, especially the 6800uf at C16) before ordering. If you require a pack with differing caps, contact me and I'll see what I can do. Also included, for the motor control PCB: 3 x 10uf, 2 x 4.7uf, 1 x 2.2uf, 1 x 1uf, 2 x 0.47uf (all radial types) these cover three of most common varients of this sub-board. Please check if you need any different types. 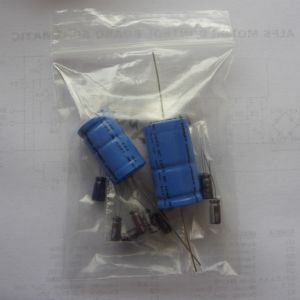 This type of modulator is found in earlier breadbins (it has a tab on the lid soldered onto the internal trimmer unit). You may wish to open your modulator to confirm these caps match your own, Commodore had a habit of revising things a lot.. 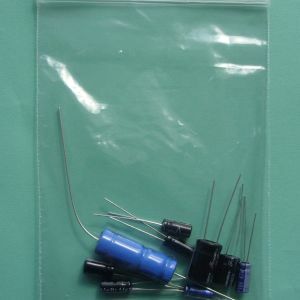 This pack consists of the following caps for the smaller C64C modulator.